Lazarus was so sick that he could not even shoo the dogs away. Lazarus suffered both of those conditions while receiving no mercy from anyone. Lazarus was not simply without help, but he was without any relief in spite of being at the gate of the rich man where many people were "present but unwilling to stretch out a hand" (30). Lazarus would have been better off in the desert where he would have at least known that he was wholly alone and without any hope of comfort. Instead poor Lazarus was in almost constant contact with people who had the means to help him but refused. "In addition to these, the sight of another person in good fortune laid on Lazarus an extra burden of anguish, not because he was envious and wicked, but because we all naturally perceive our own misfortunes more acutely by comparison with others' prosperity" (30). Isn't that the truth? Lazarus was not only forced to consider his poverty in contrast to the rich man's wealth, but he also had to endure the knowledge that the rich man flourished in spite of his wickedness. It's the sort of thing that makes one wonder if there is any justice in the world. Lazarus did not have the benefit of another Lazarus. As Chrysostom notes, "Finding companions in our sufferings either in fact or in story brings a great consolation to those in anguish" (31). In our despair, we take comfort in relating our hardships to similar experiences faced by others. Even at one's lowest moment, she can gain some relief in saying, "Well, at least I'm not as bad off as old Lazarus!" But what can Lazarus say? 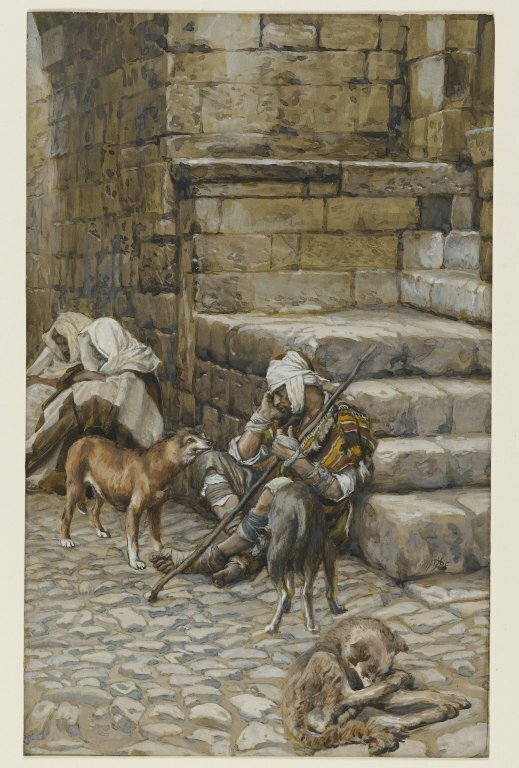 In Chrysostom's mind, no man has ever been as poor, as sick, as destitute as dear Lazarus. He found himself without peer, isolated from even the realm of human experience. Ouch. This is a pretty good one: "He could not console himself with any thought of resurrection" (31). Lazarus didn't have the benefit of the hope of a world to come in which he would be whole. For Lazarus, there was nothing but his present misery. And then Chysostom throws a zinger right at us: "His reputation was slandered by foolish people... For most people, when they see someone in hunger, illness, chronic illness, and the extremes of misfortune, do not even allow him a good reputation, but judge his life by his troubles, and think that he is surely in such misery because of wickedness" (31). This last one stings because Chrysostom makes sure that the story is no longer about Lazarus vs. the Rich Man but about Lazarus vs. us. We don't do that, do we? We don't ever assume that a man is homeless because he is an alcoholic or a drug addict or a criminal, do we? We don't ever suspect that the chronically poor might simply be lazy, do we? And we certainly don't ever blame the sick for having brought disease upon themselves through some vice, do we? Well, do we?